Jhye Richardson walks from the field. A horrible fielding mishap is likely to cost Jhye Richardson a spot in Australia's World Cup squad after the young paceman was sent home for scans on a dislocated shoulder. 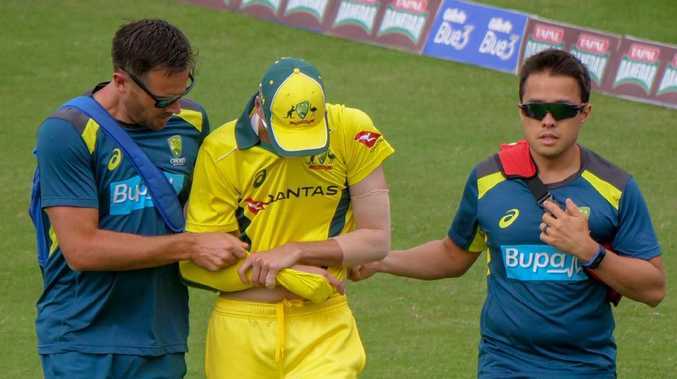 Richardson suffered the injury while attempting to stop a boundary with a dive during Sunday's ODI between Australia and Pakistan in Sharjah. The 22-year-old, who was set to be the youngest member of Australia's World Cup squad, landed on his bowling arm and immediately called for assistance. Richardson was in good spirits in the rooms, giving a thumbs up to the camera then making a point to stay upbeat around teammates after Australia's fifth consecutive ODI win. But the right-armer, now heading home to Australia for scans, is unlikely to be fit for the World Cup unless the prognosis in Perth is incredibly positive. "It's horrible to see. I hate when people dive and they come back up and you know something's wrong," Usman Khawaja said. "It makes your stomach sink … he was bowling beautifully. "He's a good kid. I'm sure he's going to come back much stronger … fingers crossed it's all good. I think it went back inpretty well, pretty easily, so that's always a good sign." Recovery periods for a dislocated shoulder, the recurring injury Chris Lynn has struggled to manage in recent years, vary greatly. If Richardson doesn't require surgery and needs only rest, then he may be part of Australia's World Cup defence. But the odds are stacked against the youngster, especially given it's his bowling arm. Richardson has gone from strength to strength in recent months, impressing on Test debut in Brisbane and forming a potent new-ball pairing with Pat Cummins during the final stages of Australia's recent 3-2 ODI series win in India. The West Australian snagged 2-16 from five overs on Sunday prior to the setback. "It's very disappointing, especially off the back of the summer that Jhye's had," Nathan Lyon said. "He's obviously pretty shattered. Fingers crossed he can be fit for the World Cup." Gun pacemen Mitchell Starc (torn pec) and Josh Hazlewood (back) are already racing the clock to be fit for the 50-over showpiece, with the latter likely to run out of time. Cummins, who was rested from the first two ODIs against Pakistan, is likely to take Richardson's place in the side when the series continues in Abu Dhabi on Wednesday. Kane Richardson and Jason Behrendorff are the other fast bowlers in Australia's 15-man squad.